There is the saying that nothing beats the real thing, but sometimes what you have to settle for ain’t to shabby. 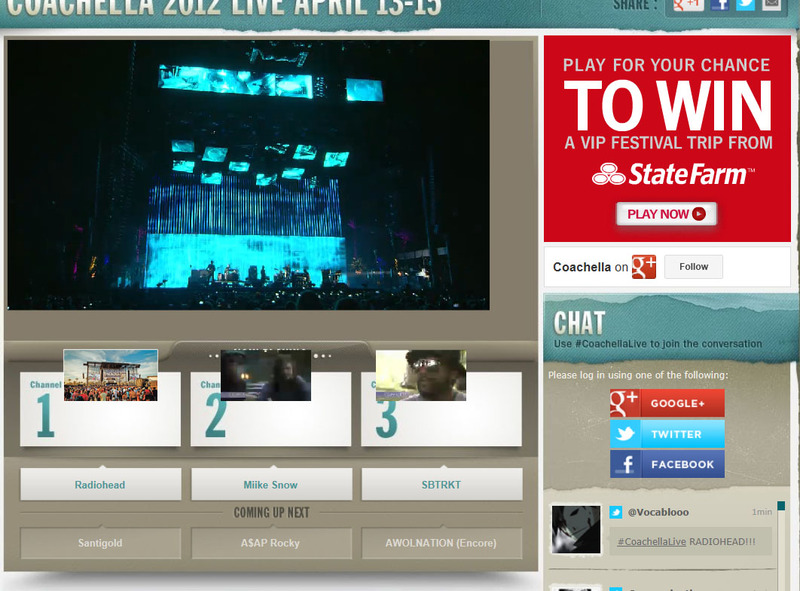 This was the case with the Coachella Live site on YouTube. For those who were not lucky enough to get tickets nor able enough to take off for a weekend of all the crazy things that happen over the course of the weekend on a Polo field, this presentation sponsored by State Farm insurance was fantastic. Sporting three live streams on a dashboard that included thumbnails of what you’re not watching, Facebook/Twitter/Google+ and a schedule of what’s to come, there was no lack of exploration and enjoyment possible. YouTube really showcased a phenomenal product and Coachella was able to serve the fix of a much larger audience to celebrate the music exploration and wonder that is Coachella. The production quality was strong throughout. The on-site direction and coverage was comprehensive and, in some instances, rivaled that of a well produced concert video. The streaming quality was better than I had expected. In most cases, both the small and full screen versions were very clear. Sometimes, the images were getting pixellated, but there was no rhyme or reason that I could make out. When the image quality was good, it was great and when it wasn’t, it wasn’t that bad. The sound quality was clear and consistent throughout – even when the picture was not. State Farm’s sponsorship was persistent, tasteful and refined while not interfering with the content. Meaning, they didn’t pause sets to show a graphic in-stream – or some other annoying ad mechanic. Though there was mention of the live streaming on YouTube and the Coachella site, I didn’t see any wide mentions or promotion for the feature. Perhaps I missed it and imagine there could have been some artist relationship elements to consider. Ultimately, the people who were most interested were able to find it – either by searching it out or finding it organically through friends’ social activity. Talking about artists relations, I was impressed that the artists allowed it – and even more impressed about some of the artists that participated. With the point of the weekend(s) being music and the exploration of new music, the site makes perfect sense. I was able to check out a solid mix of acts I knew and had even seen live before with a healthy dose of new acts. 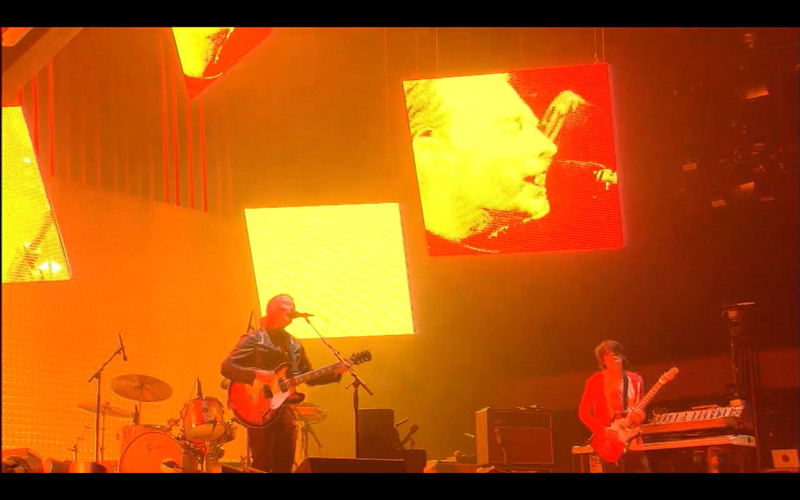 I know that the experience is not the same as being there, but I am sure that Coachella Live viewers were able to jump from stage to stage much more quickly and easily than anyone who was physically there. The fact that I could jump from a great view of Miike Snow to the pit of Radiohead without leaving my chair was awesome. On a personal note, My commute home after Radiohead’s late set on Saturday and Dr. Dre/Snoop Dogg’s star-studded show to close it all on Sunday night was much more comfortable than driving home from Indio. And, the fact that I already have State Farm insurance made me feel that I wasn’t just being a freeloader – I might even feel a little bit more loyalty to them because of it. Hopefully, this becomes a trend for more live events as it really extends the community and the technology has come about to enable that like never before. The technology upgrades has made the experience drastically different from when I spent hours in front of the television watching Live Aid as a kid. Who would have thought then that we could control what we were watching without having to suffer through commercials and annoying MTV VJ commentary?